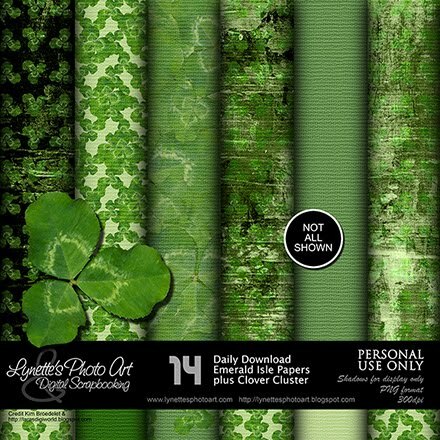 Emerald Isle is a paper kit with a clover element. Click image to enlarge. Click Buy It Now Button below the image to purchase from my PayPal Store for only $1.99. Today I'm giving you a piece of this kit to sample - enjoy! Thank you so much for this post. I want to let you know that I posted a link to your blog in CBH Digital Scrapbooking Freebies, under the Page 6 post on Jul. 16, 2011. Thanks again.